Wisconsin musician Sarah Longfield is a name you probably don’t recognise, however she was named one of the World’s Fifteen Greatest 7 & 8-string guitarists last year by Guitar World. However she’s not just a guitar player, she also plays piano, which can be heard on the album opener, the violin and also adds her voice to some of the tracks on the album. She received critical acclaim after the release of her first EP Zeal in 2011 and also her 2012 album Per Avion. She has her own YouTube page that showcases her highly-skilled talent and is well worth a visit. Sarah formed her own band, The Fire Constant, seven years ago and they have self-released two studio albums, Myriad in 2012 and Woven in Light in 2015. Her latest album, Disparity, released last year via Seasons of Mist showcases Longfield at her finest. It’s not just her playing all of the instruments, but also shows how much her compositional skills have brought to the table. For me, as I was embarking on Longfield’s music, I was taken by surprise by the album cover as Sarah’s face covered with makeup. I imagined her taking inspiration from the designs of Peter Gabriel-era Genesis, Marillion’s Fish-era, and Osanna’s Lino Vairetti, honouring the masters with the makeup and going beyond the progressive genre. Cataclysm sees her playing some incredible arpeggiated guitar textures, keyboards taking the listener down the rabbit hole with Alice, to Wonderland and through the Looking Glass. Then there are trip-hop sections before Sarah channels the mid-section of Steve Hackett’s Voyage of the Acolyte. When you hear the gentle melodies of Embracing Solace, they sound like raindrops pouring down as Sarah sings so beautifully, with incredible waltz sequences that point towards the end of the world. On Departure Sarah’s lyrics tackle the issue of depression. It has the essence of Asian music, thundering guitar lines and pounding drums creating a storm front, but it’s the last 30 seconds that give us moments of mournful piano, allowing Longfield a chance to close the curtains before opening up the next storyline. Citrine is Sarah’s tribute to the late great Allan Holdsworth, tipping her hat to the maestro as she creates her own take of the SynthAxe on her instrument, with some electronic loops, smooth jazzy grooves, relaxing saxophone improvisation, and meditating to a sudden vibration. With The Fall, Sarah channels the Face Dances-era of The Who and honours Pete Townshend’s structure. It then changes into the Indian textures of Steve Vai and Frank Zappa, rolling into metallic riffs on the intro and then doing it again to create a nightmarish view of the future. 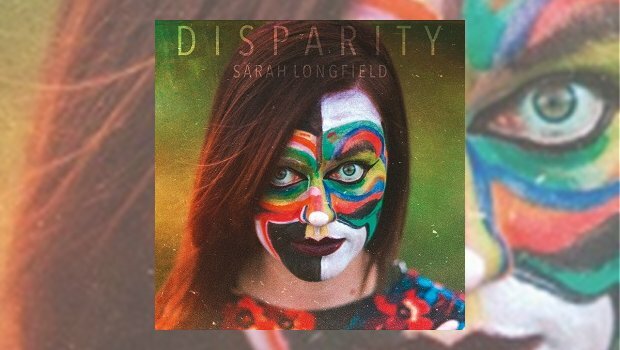 Disparity took me a few listens to fully appreciate Sarah Longfield’s creativity, but she has achieved her goals with this very strong release, and I will be keeping an eye out to see what she comes up with next.